Depending on what type of law you practice, many law firms are a little like realtors where they have the distinct disadvantage of having a big revolving door when it comes to their client bases. Once a case is over, away the client goes (at least for awhile), and they need to find another. Even firms with retainers still need methods of attracting new clients to fill up their roster. Lawyers and attorneys are often very thorough people, making sure they leave no stone unturned with the cases they work. You should take this same exact approach to your marketing campaigns to attract new clients, build a reputation for your firm, and grow your business. These 5 effective law firm advertising strategies can help with that. Every line of text on your site is an opportunity for search engine optimization (SEO). That doesn’t mean that your site should read like it’s just stuffed up of keywords, but by being intentional about what you’re writing and how you’re writing it, you could create more content that ranks well in search engines. Your blog post or FAQ section, for example, could have sections of text that are designed to be a perfect fit for Google’s featured snippet tool, which puts you at the top of Google’s results. Being able to snag that spot will mean prime visibility, the opportunity to establish yourself as the expert, and a lot of clicks. While most featured snippets come from already top-ranking sites on Google, creating direct answers to questions in your field could give you a shot. Even outside of featured snippets, more content gives you a chance to provide additional value to customers while targeting different keywords. Be proactive about your keyword research and—if you’re having trouble ranking—get creative and look for long-tail keywords that have low competition but higher transactional intent. An example of this might be searches for “do I need a lawyer after a car accident” or “how much do personal injury attorneys cost”. 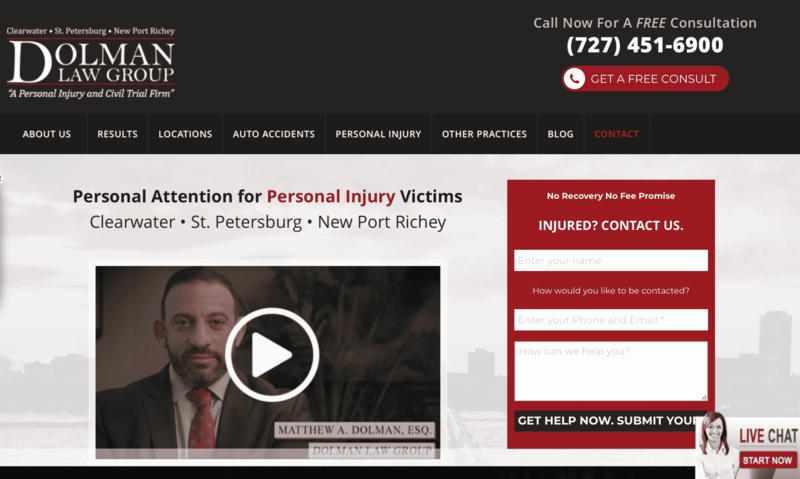 People searching for these phrases likely need a personal injury attorney and writing a blog post around that very question could help you get their business. A lot of law firm’s sites are not user-friendly, so set yourself apart and make it easy for potential clients to see who you are, what you can do for them, and how to get in touch with you quickly. Your site should be designed to work like a funnel, pushing users through a clear path to get to the end destination. In this case, the starting point would be the home page, and the final destination would be getting in touch with your firm. Everything in between is all about getting users to the content they need to see in order t convert, while having that “contact us” CTA present every step of the way. 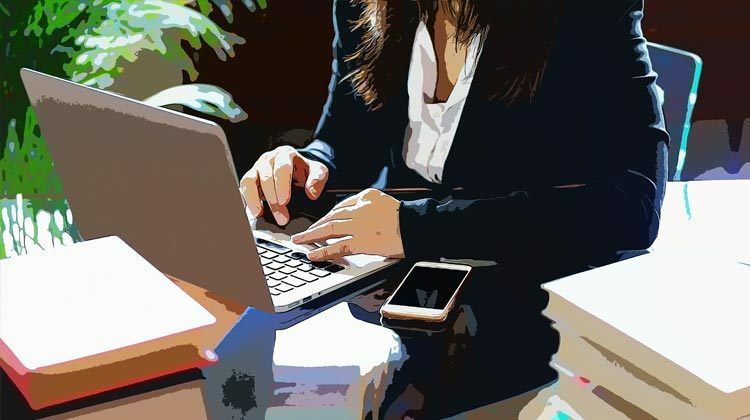 Have a clean site, staring with a brief summary of your firm and what makes you unique on the main page. Include CTAs that encourage users to either submit forms or click to learn more about your firm or the individual attorneys there. From this page, you could then funnel users towards the FAQ or yet another CTA encouraging them to get in touch. Be intentional about your site design, and make sure than any designer and copywriter you hire is, too. 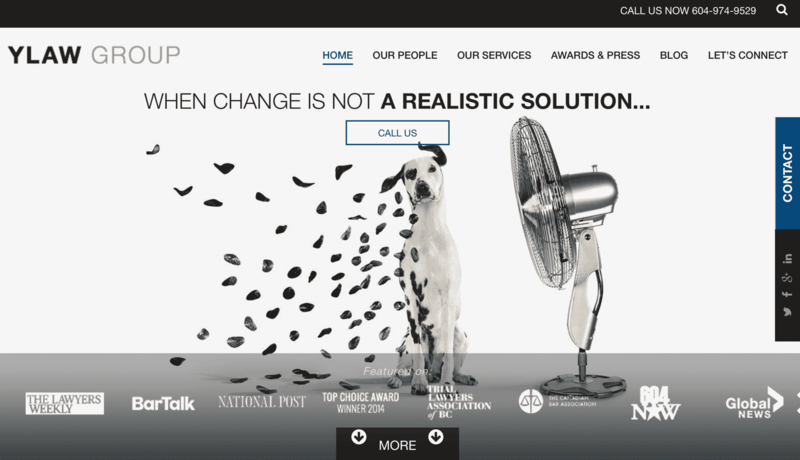 Want to see some solid examples of how to create a solid site design? 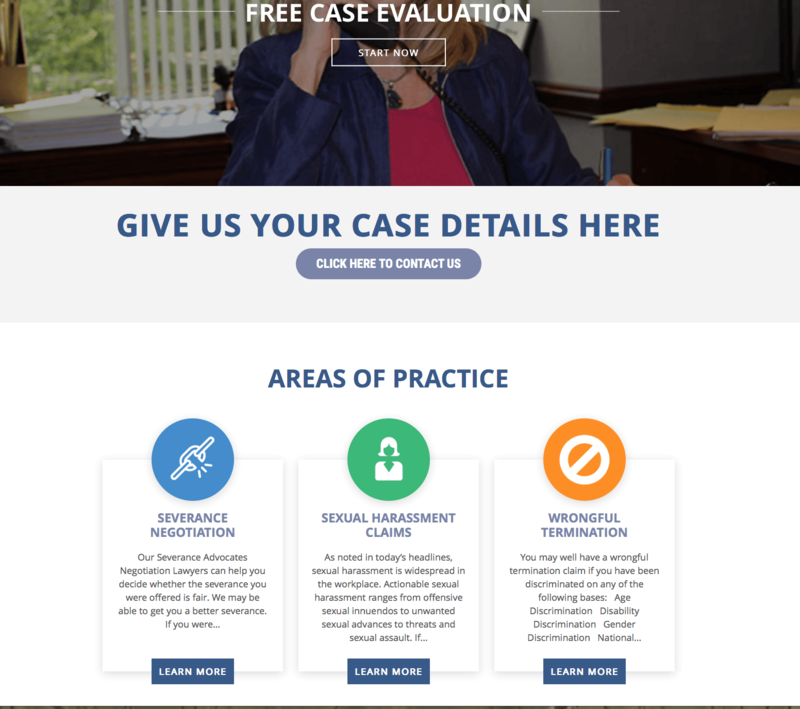 Check out our go-to guide on website design for law firms here. We’ve touched on this in the point above about site design, but this is so important it can’t be overlooked. You should use a deliberate and consistent combination of incentives or offers, contact forms, and CTAs to actually generate contact. This is a crucial formula, and you need all three parts for best results. The example above actually used a financial incentive. Similarly, the CTA will encourage people to act right now instead of aimlessly clicking around on the site, and having a contact form immediately available will unsurprisingly increase conversions quickly. Fortunately, this is a pretty easily formula to follow. If your current site isn’t structured this way, all it takes is a few minutes to update the copy and you’ll be good to go. A few weeks back, I gave a guest lecture about branding at a community college and I asked the class to close their eyes and write down the first car insurance company that came to mind. I then asked how many people had written down Geico, and about 75% of the class raised their hands. After some discussion, it was revealed that a big chunk of these students didn’t even have Geico—they used another provider, and yet Geico’s branding and advertising led them to think of that company first. We want you to be the Geico of law firm advertising. While the law can be cut and dry, most lawyers get creative to help their clients find the best solutions possible. You should be doing the same with your marketing, embracing what makes you unique and highlighting it. A little creativity goes a long way, after all. Not sure how to do this? 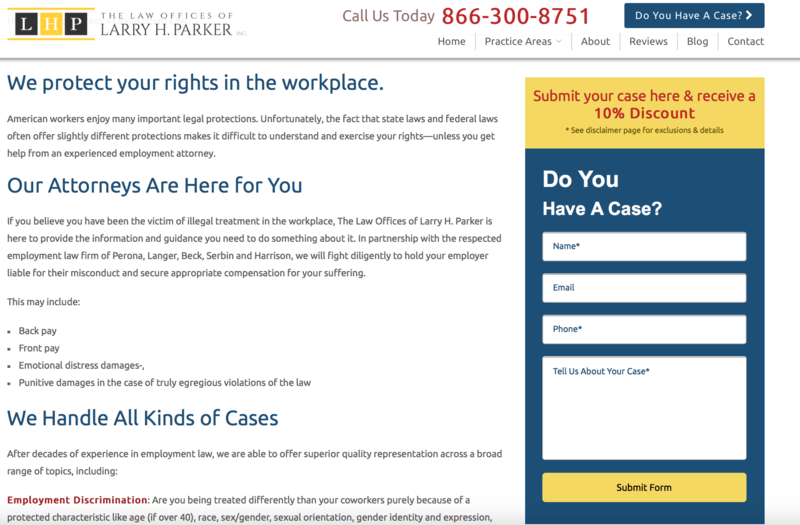 There’s some great examples of law firm sites who embrace distinct branding here. Some firms go for an aggressive, fierce brand, while others aim to be relatable and accessible. Different brands will work for different clients, and embracing your brand will help you find the right clients for you. Google AdWords is the fastest way to get your site skyrocketing in search engine placement. If you want to give your SERPs a boost, this will help you get major visibility quickly. AdWords gives you the massive advantage of being able to show your ad to people who are in the research stage of the sales funnel. They’re looking for someone who offers the same services you do and they’re likely close to contacting or hiring someone. You want that someone to be you. 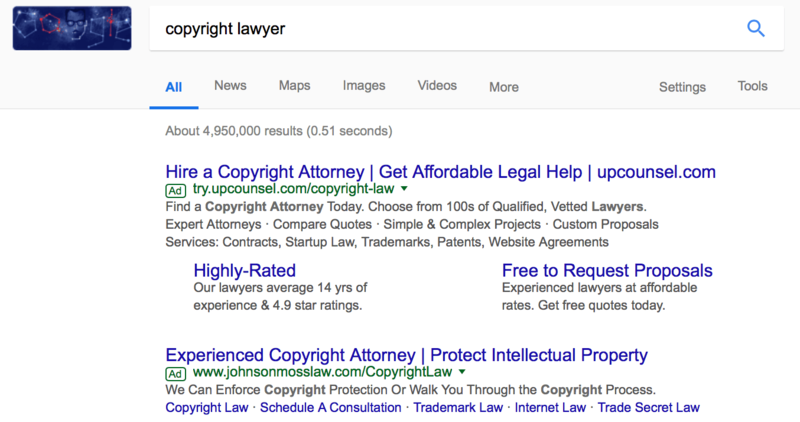 For best results with Google AdWords for your firm, use the copy in your law firm advertising strategically. List specific services you offer or distinct benefits that come with hiring you. This will help set you apart from your competition, even if they’re scoring a higher ad rank than you. A great example of this is the ad below, where the family lawyer puts the emphasis on what most parents care about most: the children. This is a strong emotional appeal that will set them apart and get more conversions. For more specific examples and detailed strategies, check out our post on AdWords for lawyers here. Building the right foundations for your law firm advertising will help your target audience find you. This will enable you to grow your client list more efficiently without as much effort on your part. Each of these law firm marketing strategies will help you build those foundations and connect with clients who are looking for you. Need help building your online presence or running AdWords campaigns? Disruptive Advertising can help you with all of the above. Get in touch with us and see how we can help your firm put its best foot forward (virtually speaking, of course). What do you think? Do you use any of these law firm advertising strategies to attract new clients and grow your firm? Share your thoughts, knowledge, and questions in the comments below!